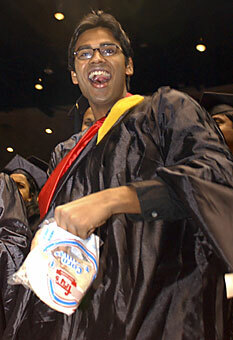 In past year's commencement ceremonies the tradition has been to throw tortillas to celebrate the occasion. This year ASUA and administrators are encouraging students to throw Flutter Fetti. At this year's commencement ceremony, don't toss tortillas - fling Flutter Fetti! At least that is the message administrators are advocating in response to the annual tortilla tossing tribulations. President Peter Likins said the Associated Students of the University of Arizona, the UofA Bookstore and the Alumni Association will "introduce a new element to the ceremonies called Flutter Fetti to enhance the joyfulness of the occasions." Flutter Fetti, which shoots out of a tube, is more aerodynamic than regular confetti and suspends in the air for a minute, said Alexis Hernandez, associate dean of students, who had the idea of using Flutter Fetti after seeing it at a conference. "I thought it was really cool," Hernandez said. The practice of throwing tortillas during graduation reached a boiling point this year when administrators cancelled the university-wide December ceremony, citing a lack of decorum, only to restore it a few weeks later after students protested. In previous years, administrators told students tortilla tossing is troubling because it is wasteful, offensive to minority groups, a safety hazard and unnerves graduation speakers who are unfamiliar with the act. Lori Goldman, chairwoman of the Commencement Policy Committee and director of enrollment management, said it is not acceptable to throw tortillas during the graduation ceremony, and security will step in if they see anyone with tortillas. Socorro Carrizosa, director of Chicano-Hispano Student Affairs, said tortilla throwing is offensive because it is a waste of food. "Many (minority) individuals do think it's offensive, but mainly what I hear is that it's just inappropriate," Carrizosa said. "It puts the university students in a very bad light, and is that really how they want to be represented, as people who are wasteful, disrespectful?" Goldman said although students are not necessarily at risk of losing the ceremony again, the Commencement Polity Committee will review student behavior this summer and consider if students value the ceremony, determining whether or not the practice should continue. While a few tortillas journeyed through the sky during the December ceremony, Goldman said she saw a significant decrease compared to previous years. "Students took it as a very serious warning that they need to monitor their behavior," Goldman said. Student honor marshals, adorned in red robes, will also be available at graduation to aid students and parents who have questions and ensure the ceremonies run smoothly. Fernando Ascencio, co-head student honor marshal, said he understands graduation is a time of celebration, but students should be respectful while rejoicing and having fun. Drew Record, co-head student honor marshal, said although students never meant to be offensive while throwing tortillas, the move to Flutter Fetti is a positive change because it gives graduates something acceptable to "fling about." "It's less destructive than silly spray," Record said. The bookstores are selling tubes of red and blue Flutter Fetti, Hernandez said. Although pieces of Flutter Fetti will be found in McKale Center months after graduation, Hernandez said students "can bring in bag loads of this stuff."